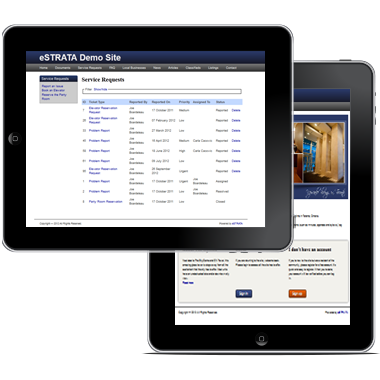 An eStrata site can help improve communication between owners, residents, council members and property manager. We care about our customers and the communities they live in. Let us prove it to you. 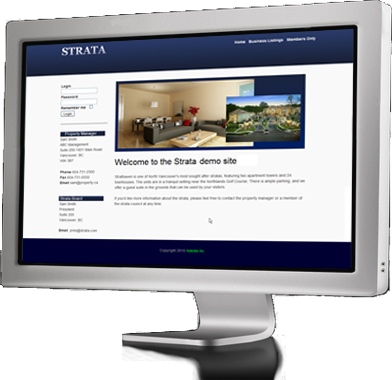 Your eStrata condo website will look great and give you the tools to easily manage your communication needs. It will benefit everyone involved: residents, owners, property managers, strata councils, homeowner associations, and condo / co-op boards. Our process is simple. Check out our demo site. If you like what you see, give us a call or send us an email. Tell us a bit about your condo and the type of features you're looking for. We'll put the basic site together for you (including our current feature set) and we'll let you know when you can expect future features to be released. Once your eStrata site is up and running, you can start uploading files, posting events, adding news and articles and more. eStrata is very easy to use - even by non-technical people. Then send out the website address to your neighbors so they can sign up and enjoy all the site has to offer. When you sign up for a website, there's a one-time setup fee of $250.00. Once your website is up and running, we charge an affordable subscription fee. There are no long-term contracts. We'd hate to see you go, but if you decide to cancel, there are no termination fees and no hidden costs. Our websites are intuitive. You’ll pick them up in no time and will be able to administer your own site, make edits, add documents, post information to notice boards and more. If you run into problems, call or email us any time! If you have an idea for an online tool that will streamline or simplify the day-to-day operations of your residence, call and tell us about it. We work hard to roll out useful tools that our clients really need. And we love a good challenge! At eStrata, we take great pride in our efforts to keep your personal information safe and secure. We can't guarantee our solution is fool proof (no company can, for that matter), but we go above and beyond; we use the latest technologies and only work with reputable 3rd parties - such as Amazon Web Services.